It’s 10am on January 1st and I’m sitting in a yoga studio waiting for class to start. I’m feeling good, like I’m starting the year off strong when my instructor throws a curveball. Instead of starting class with the typical breathing exercise or meditation, she asks us all to go around the room and share our intentions for the new year. 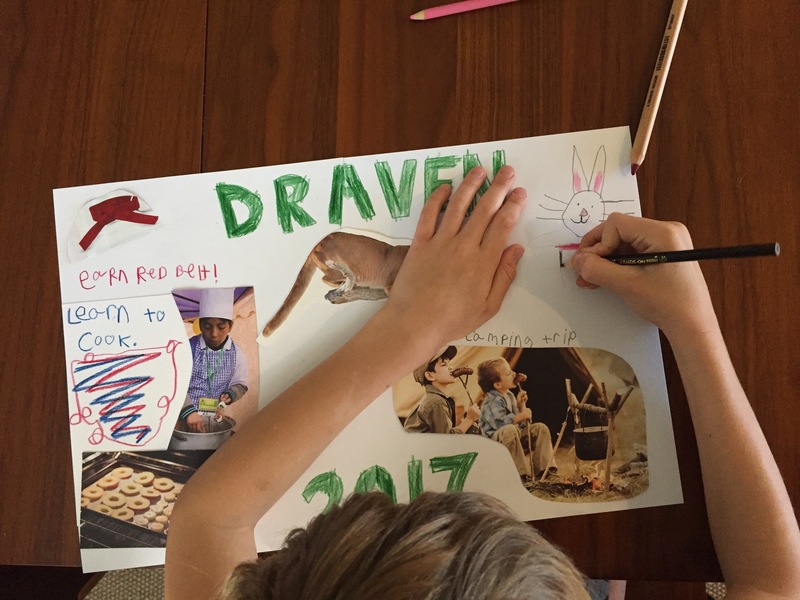 Now I’ve been talking with our boys about their 2017 goals since the day after Christmas. Each of them has a list of things they want to accomplish and are planning to create vision boards to hang in their room. 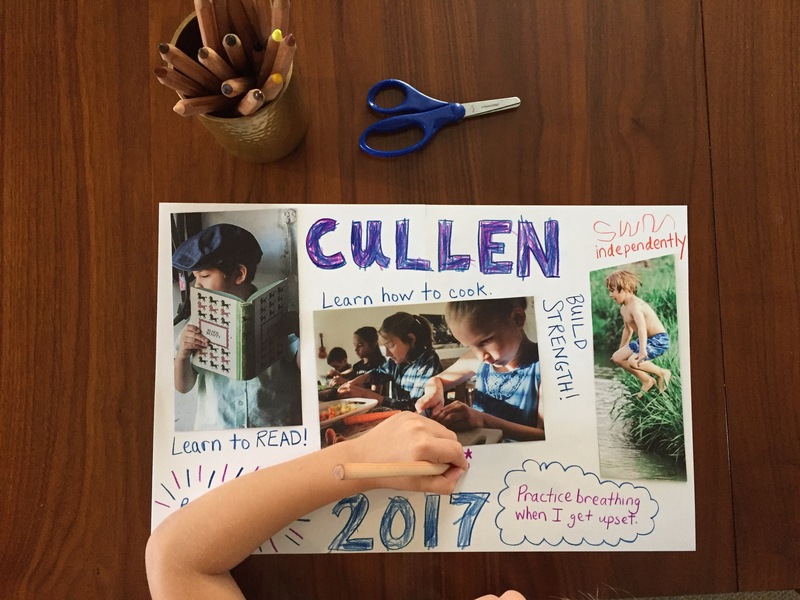 The lists are filled with things like “earn my red belt in karate” and “learn how to read independently.” They are all specific, attainable goals that the boys are both excited to achieve. But, the only thing Andrew and I have made time to talk about so far is saving more money. We don’t have a plan, except we want to spend less and save more. Really good plan, right? So I share this with the class and my yoga instructor very sweetly says it is a good goal. But as I sit listening to others share and have time to think about it, our goal is not specific, it’s not measurable and it’s not trackable, which doesn’t give me much confidence in our ability to achieve it. As class goes on I keep going back to my yoga instructor’s word intention. She used this word instead of goal or resolution and it really began to resonate with me. When I got home, I revisited this topic with Andrew and our children and we reframed the goal setting conversation. Some questions I asked were – What are the most important things to us? Are they even things? What do we want to be intentional about? Why do we want to save money? Are there certain behaviors we want to change? And from the answers we narrowed down two areas in our life where we felt we needed to be more intentional – with our money and our time. In order to really dig in and make significant change, we are focusing on one intention at a time. The past few weeks we have focused on our finances and I thought I would share a bit of our journey with you. Our family of five lives in a modest size home just over 1600 square feet. We really adore our small house and have enjoyed coming up with creative space saving and storage solutions (I’ll try and share those in a future post) but looking to the future, we would like to have a bit more space for our growing family. Not more house per say, just more land – untouched land with trees, a space to grow a garden and room for our kids to explore unrestricted. But land like this in Austin doesn’t come cheap. In addition to this big dream of ours, there is also a voice speaking loudly to both of us to give more of our money. So now we have to figure out how to do both of these things. Neither Andrew or I have ever been good at financial planning. We’ve talked about it but never set a budget of any kind (Sorry Dad, I know you have been telling me to set a budget since I moved out 20 years ago). It’s a little embarrassing to say but we’re kind of going into this blind. Currently, we’re reading a book recommended by Andrew’s mentor called Smart Couples Finish Rich by David Bach. I promise it’s way less superficial than it sounds. What I love about the book is that Bach starts by asking couples to take an honest look at their core values and goals and share this with their partner. This, he says, is the starting point to setting specific financial goals. It is an easy book to read, not boring at all and has really resonated with us. I highly recommend it although we are not quite halfway through yet. By the way, reading a book together has been really fun. When we are finished with this one, we’ll most likely read something else together. Picture me reading aloud to the both of us – it’s not much different than my read alouds with the kids. Recently I was reading aloud while Andrew was driving the family to the gym and Bach was giving examples of how very little money could turn into a million with the right investment strategy. An example he used was, if a seven year old boy invested $1/day at 15% interest, he would be a millionaire by the age of 47. Well that certainly sparked our 7 year old’s attention and suddenly the kids became part of our financial conversation. We have set budgets for both boys depending on their age and allowance allocation. 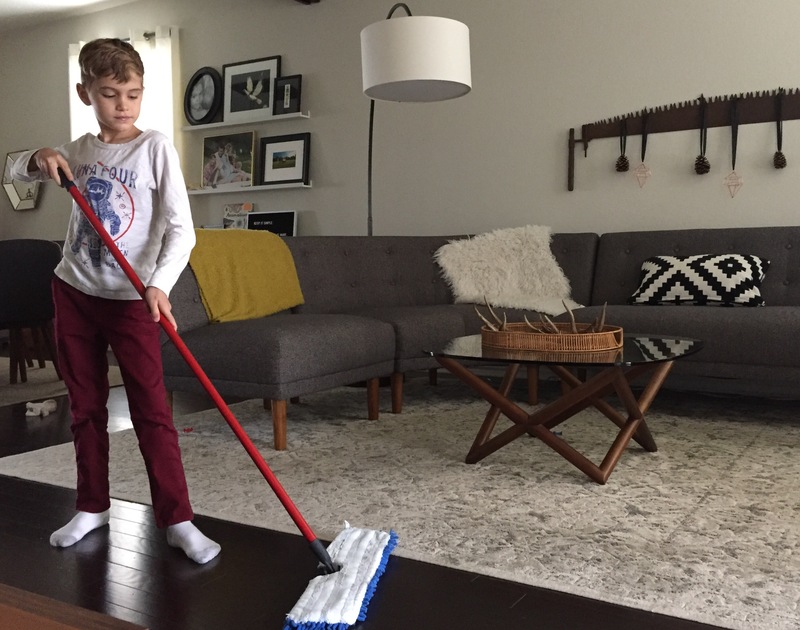 They each get a set allowance at the end of the week if they complete each chore on their list. We also discussed how they would like to allocate their money and decided they would put 1/3 into savings, 1/3 will be donated and 1/3 is theirs to do with what they wish. 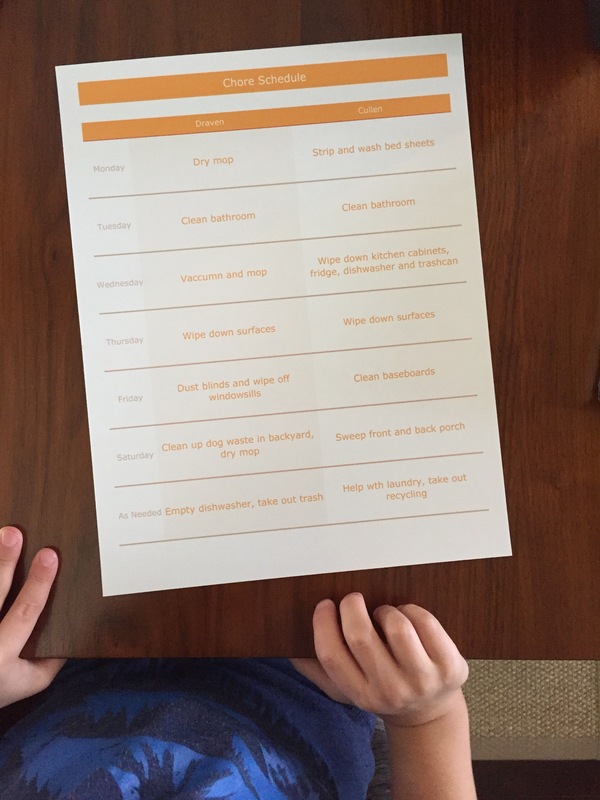 We created their budget worksheets from a simple Excel template and they now have these hanging on their bedroom door by their completed vision boards. Recently, we made the decision as a family to sponsor a precious foster mom through Austin Angels‘ Love Box program. As I’m writing this, we are about leave to meet the mom and her 9 month old twin foster daughters for the first time. The foster mom is fostering through the kinship program and gets no government assistance for the girls. We have been talking about and praying for the twins and their foster mom as a family but I was completely blown away when both of the boys asked to give their monthly donation money to help buy formula and diapers for the twins. It’s one of those moments I will treasure forever. As for the boys’ savings, we will be opening accounts for them that may soon be transferred to stocks (to earn more interest) as we learn more about investing. Draven is pumped to be saving for his first car and Cullen has dreams of buying spy gear with his spending money. Needless to say, they are both happy to be on this journey with us and I’m just thankful to be able to give them the gift of a financial education. I should also mention that Andrew has been listening to Dave Ramsey’s Financial Peace on Audible on his commute to work. 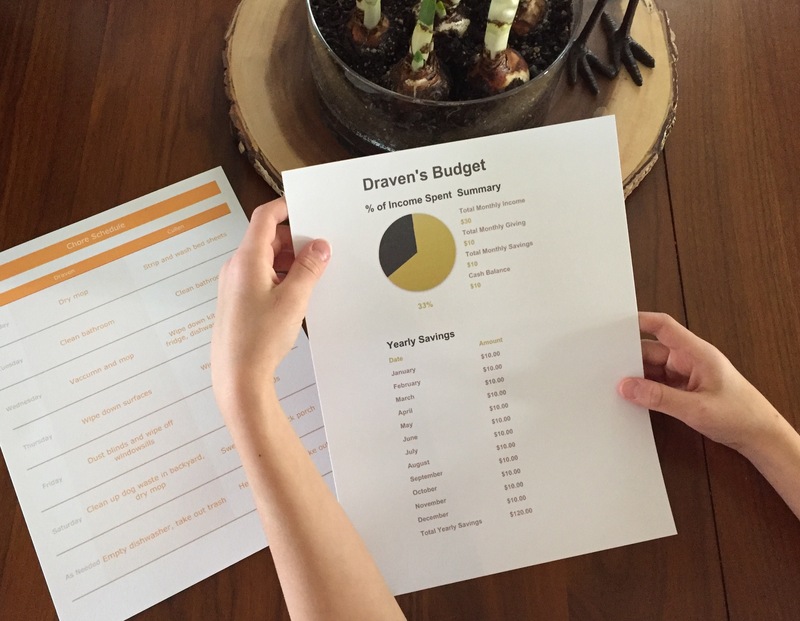 We are currently working on a budget and will be trying Ramsey’s envelope system to keep us in track with some of our monthly expenses like food, spending money and gas. 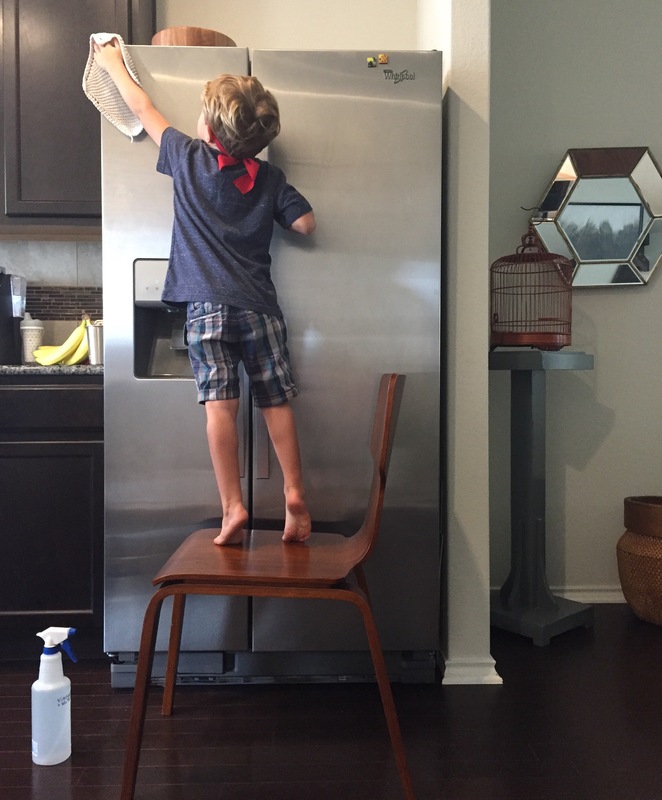 As a family of five, food is one of our biggest expenses but we were both appalled at the money we could be saving if we were simply more intentional about meal planning and avoiding incidental food purchases. Last week we decided to not spend any money except on groceries and gas and it was actually a really fun challenge. 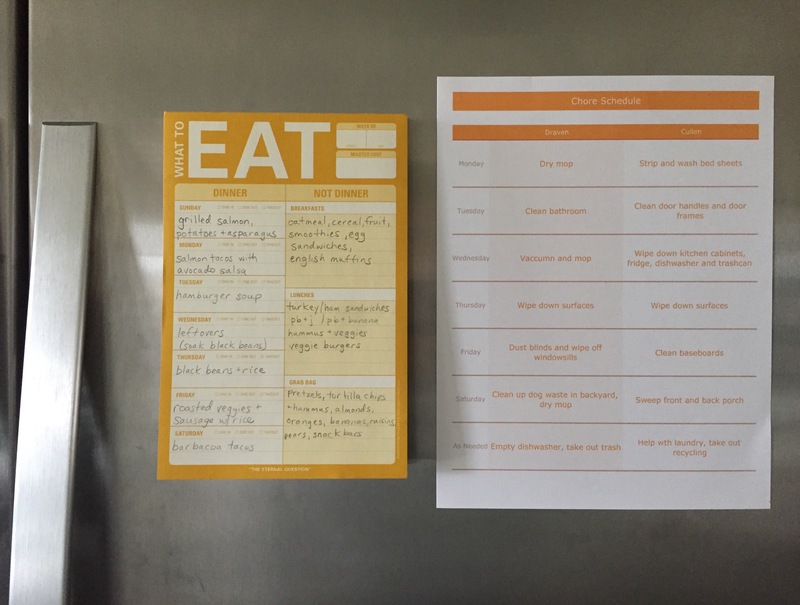 Surprisingly, meal planning has also been fun for me – it’s kind of like putting together pieces of a puzzle. We both love a good challenge and I think as long as we’re in this together, we are going to succeed. It’s been quite exciting to take control of this part of our life we haven’t been very intentional about. What started as a vague goal of saving money has transformed into us redefining our financial future. I hope to share our plan to be more intentional with our time with you soon and would love to hear about your new year intentions! We did the envelope system when we first got married! It works great! Let me know how it works out for you guys and if you have any questions! Well, I’m not an expert but I love talking savings and planning with people 🙂 I finally opened my own IRA a couple years ago.